In Ragnarok Thor is tasked with saving Asgard from certain destruction (Ragnarok) at the hands of the all-powerful, Hela (Cate Blanchett). Along the way he ends up on Sakarr, a junkyard planet ruled by The Grand Master (Jeff Goldblum), where he must fight his way to freedom in a Gladiatorial Battle to the death. People have said Ragnarok is a very 'jokey' Thor movie, but Thor movies have always used humor. Here it's just a more in your face, with Thor instigating some of the jokes rather than simply playing the straight man for the jokes to bounce off. (As they should given Chris is so good at comedy acting). As well, director Taika Waititi's brand of humor stands out as very different to the humor in any other Marvel movie. The kind of humor where you take grand ideas and layer 'normality and mundane' over the top... such as what would you actually have to do to start a revolution? Print posters maybe? (I'm a big fan of this kind of comedy). There's a lot to like within this film. Most notable is seeing Hulk be more than a raging, angry smash machine for the first time. It's a little jarring to see Hulk talk like a regular person but he's done that for a long time in the comics, it's about time someone finally translated that to the movie version. Cate Blanchett, as Hela, makes for a formidable villain, even if she is just another bad guy/girl wanting to rule the universe (...hey lady, there's a queue!). It's a character that I would not mind seeing again in a future Thor movie (that's not really a spoiler, she may have died in this film - you don't know - I'm just sayin' - she's very believable as a force to be reckoned with when your main character is a god). You also see a lot more interesting technology and more of the universe in Sakarr, a planet that feels like it belongs more in a Guardians of the Galaxy movie but got lost on the way to set - which is not a put down. You could set a whole movie on that planet and it would be amazing. The film does have a few issues. For me, the main one is in the third act (don't worry no spoilers ahead) where time seems to stand still on several occasions for a critical piece of dialogue or moment, then starts up again when that moment passes. The kind of thing where you have a large scale battle happening and the two main characters need to exchange glares/dialogue, license plate numbers (I don't know, whatever they have to do) and neither of them is interrupted by an elbow to the back of the head from someone fighting nearby. There's a couple of other questionable moments in the film I have but to mention them here would spoil the end of the film. Neither of them will spoil your enjoyment of the movie should you discover the same issues. Overall it is a fun movie. 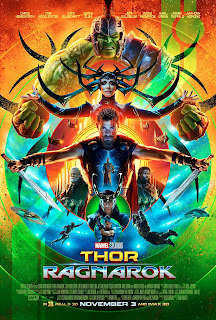 Some critics are saying it's easily the best Thor movie but I'm not so sure. The first Thor film, in my opinion has a much stronger character arc for Thor. Here the Thor at the start of the film is still the same at the end, just a little more battle weary and a little more knowledgeable about his own abilities. That said, the film does set the stage for next year's Infinity War movie, so if you're following the across movie story arc's you'll definitely want to see Thor Ragnarok. You'll also want to see it if you've been missing the Hulk - rumor has it this is part one of a three movie character arc for the big green guy. 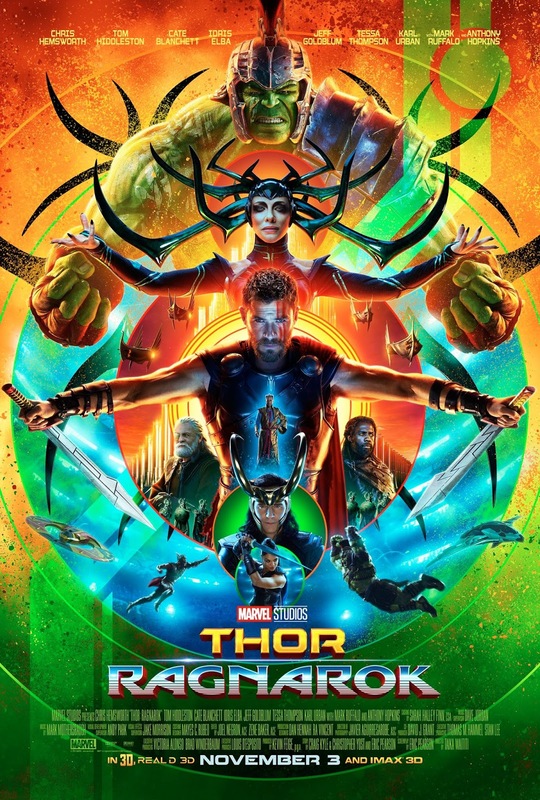 I saw Thor Ragnarok in 3D, which was kind of good but not essential. I'm actually over seeing movies in 3D, we just didn't realize the session we chose to was going to be a 3D one, and didn't want to wait until the regular 2D session. 3D always looks great for about the first 20 minutes of a film then you stop noticing it (at least I do) because you're more interested in the story and not the 3D effect. That's pretty much how the 3D version of this movie panned out for me. Well worth seeing in a theatre. You may even see it a couple of times because it really is a lot of fun. You just won't be analyzing the film too much after you've seen it. Everything you need to know is all in the film.